Weldbond glue is the preferred adhesive of mosaic artists. Non-toxic, acid-free, odourless and multi-functional, it dries completely within an hour of application and is transparent and flexible with no cracking when fully bonded. Weldbond will adhere to hundreds of materials, including cement, concrete, bricks, plaster, metal, glass, wood and tiles. There is really no need for any other type of glue, Weldbond is perfect for small mosaic tile projects where detailed work with small tiles is required. For mosaics exposed to constant humidity or for outdoor mosaics use a thinset bonding mortar or an outdoor adhesive. You can also mix Weldbond with water to get an incredible strengthening agent, which is great for adding to concrete to create a super-durable mosaic stepping stones. 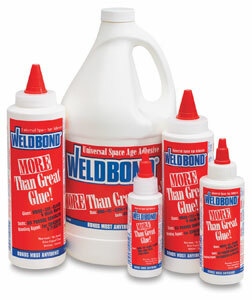 Weldbond is available in many sizes from a 2 oz. to half gallon.